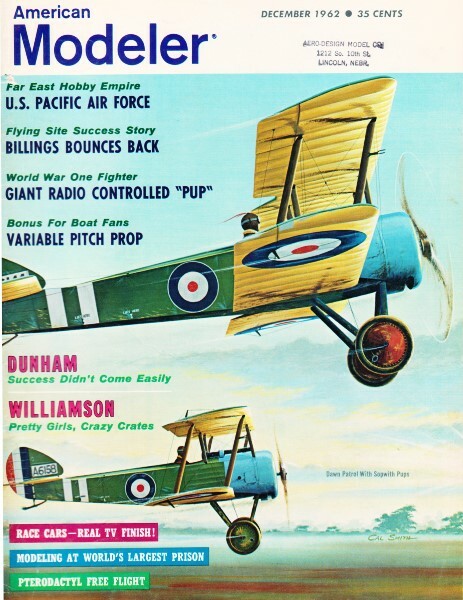 Radio controlled models of birds have been popular for a long time. You might recall the R/C version of Jonathan Livingston Seagull that was made for the movie back in the 1970s (it showed up in an edition of RC Modeler), and then various others have appeared in modeling magazines throughout the decades. The Best of Show winner at the Toledo show in 2011 was a giant size, twin turbine powered, fire breathing dragon! 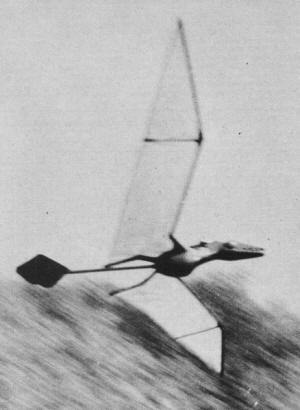 This "Peter O'Dactyl" pterodactyl model was published in American Modeler back in 1962 by Roy Clough, Jr. He even included a little background information on pterodons. Its 36" wingspan and simple stick and tissue construction makes it a great novelty project for stirring up interest in young modelers. 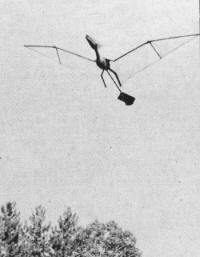 With today's micro miniature electric power packages and radios, your pterodactyl could easily be fitted for R/C flight. 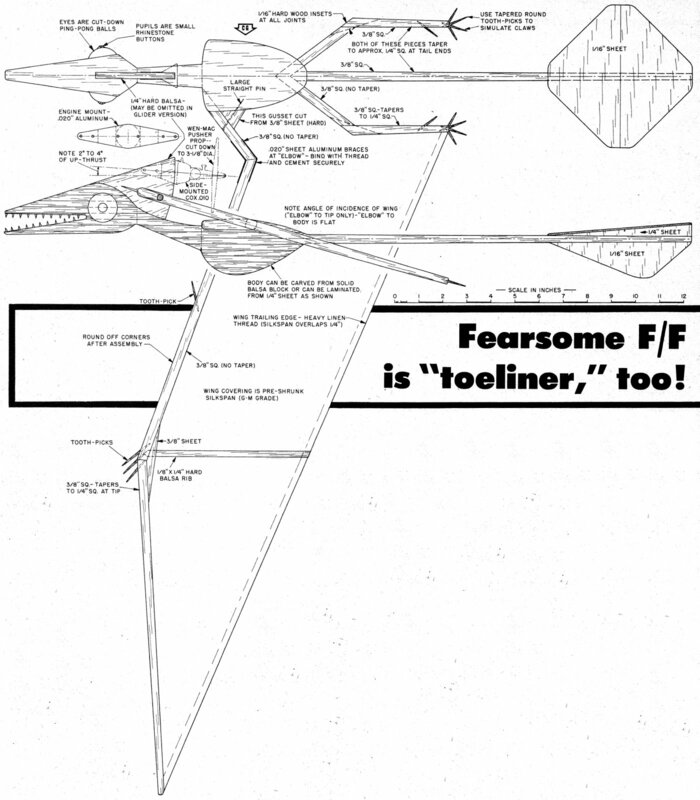 Peter O'Dactyl F/F is "Toeliner," Too! What has Roy Clough Jr come up with this time! A free-flight reptile? It can also fly without power as a towline glider? Well, it should wake up the scale model judges. Hobby Helpers has the full size Peter O'Dactyl on their Plan #1262. This free flying dragon is right out of the Jurassic period. As a towline glider, or powered with a tiny glow engine, it wheels across the sky with all the awesome grandeur of its remote reptilian ancestors. Once the most numerous flying species on earth, the pterodactyls (ter-o-dak-til) came in a dozen varieties. They ranged in size from tiny winged lizards one foot long to majestic soaring monsters whose wing span approached 30 feet. With a wing structure bearing a superficial resemblance to modem bats these flying reptiles were probably the smartest members of the dinosaur family which included the 80-ton Brontosaurus, the terrible Tyrannosaurus Rex and that fighting tank of the dawn age, Triceratops. Fossilized skulls indicate the pterodactyl brain was far advanced over the walnut-sized think-tanks of the ground-bound behemoths. Despite a certain resemblance to bats, pterodactyls were skeletally different from anything before or since. Unlike bats, whose wings are an extended hand or claw, the pterodactyl's "main wing spar" was an extended and enormously developed little finger. Hence the name, which means winged finger, or feather-toe, depending upon how you slice your Greek. The wing itself was a membrane that stretched from the tip of the little finger to the ankle of the creature's hind leg. It is rather doubtful that these airborne lizards were the fearsome things depicted by some imaginative writers. They were very lightly built. Nothing on earth today approaches their extremely light wing-loading - even the largest, the toothless, fish eating pteranodon with a wing spread of over 25 feet, probably weighed not more than 30-lbs as an adult. Like many flying creatures their bones were hollow, but with an interesting difference-the wing bones were open to the circulation of air. They were probably not very rugged ... flying creatures must exchange skeletal strength for lightness. The wing (finger and arm) bones of pteranodon were about 2" in diameter, but had a wall thickness of less than 1/16 inch. Unlike most reptiles they had a bird-like keel bone, or breast plate for the attachment of their powerful flight muscles. A peculiar crest-like skull formation was found in some orders. The structure of these creatures suggests they were exceptional gliders and soarers but not very strong flappers. They were probably pretty clumsy on land, although able via three claw-like fingers to grasp and hold prey with that part of their hand not used as a wing. Our model is something of a compromise between strict biological accuracy and engineering considerations necessary to secure good flying characteristics. Instead of extensively changing the shape of one beast, we combined the best features of several to obtain a configuration which would fly well and put up a convincing appearance in the air. Thus, "Peter O'Dactyl" is a hybrid creature with the basic skeletal arrangement of pteranodon, but the diamond shaped tail of the smaller Rhamphorhynchus. Teeth found in some pterodactyls are absent in others. We used 'em to produce an engaging toothy grin. The crest which we needed as .an engine attachment has ample precedent. Two wing ribs (which the original beastie did not have) were larded on to prevent the trailing edge of the wing from bellying upward and changing the angle of incidence in flight. When you add to this a small vertical fin Pete still emerges a rather accurate representation of the type of creature that once ruled the air. Construction is simple enough with only a couple of variations from gas model practice to be noted. The solid balsa body is carved from a bandsawed block of medium weight wood - or the rough outlines can be built up from scraps before whittling to shape. We find the, white glues - polyvinyls-best suited to this Purpose. Wing and leg structure is 3/8" hard balsa strip. Joints are keyed with a strip of 1/16" hardwood at each break. Inboard wing joints (elbows) are additionally reinforced by aluminum strips, cemented with Ambroid or equivalent and lashed in place with thread. Assemble wing and leg "bones" to body using pins and plenty of cement. The tail is simply a 3/8" balsa boom to which 1/16" sheet surfaces are cemented. Note that an incidence block is used here. When everything is thoroughly dry round off the edges of all the "bones" with sandpaper. I don't know for certain what color pterodactyls sported but green seems reasonable. Wing covering is heavy weight gas model Silkspan dyed with Baker's green food coloring which also takes the shrink out of the paper. Pull it up moderately tight but do not dope. Paint body dark green, inside of mouth red. The toothpick teeth are put in after doping. Use the flat variety and cut them off at a fearsomely jagged angle. The claws, bits of round toothpicks, may be painted yellow or the same color as the rest of the model. The eyes are sliced from table tennis balls and have rhinestone buttons (available at the dime store) for pupils ... the way the light reflects from them gives the impression that Peter's eyes follow you wherever you go. With the angles shown Peter O'Dactyl should glide nearly right although a touch of ballast fore or aft may be needed depending upon the density of the wood used. We used a Tee Dee .010 to produce a slow sweeping flight for maximum spectator effect. We suggest the model be flown with the powerplant mounted pusher fashion (with a cut-down Wen Mac plastic pusher prop) in an aluminum clip fastened to the crest. This way the motor can be removed easily for display or towline flying.